Marvel's hot streak is going to continue with Infinity War, as the movie is expected to make $235 million on its opening weekend at the box office. It's early, but box office tracking has started for Avengers: Infinity War, which is now coming out earlier than expected on April 27. That's great news for Marvel fans, who are going to be turning up in droves in order to see Thanos finally, properly make his way into the Marvel Cinematic Universe. All of this buildup is looking like it's going to pay off, as the movie is heading toward a record-breaking opening weekend. The predicted $235 million opening for Avengers: Infinity War would be easily the biggest for a Marvel movie to date. That record currently belongs to The Avengers, which made $207.4 million on its opening weekend in 2012. Black Panther came awfully close to beating that recently, as the movie of the moment made $202 million on its opening weekend last month, but ultimately climbed to an incredible $242 million over the course of the four-day holiday weekend. With that in mind, Infinity War will surely benefit by coming out so close to Black Panther, as the characters from the movie, and the now beloved fictional land of Wakanda, are going to be featured prominently in the new Avengers movie. If these numbers are anywhere near accurate, Avengers: Infinity War will become just the sixth movie in history to make more than $200 million domestically in its opening weekend. 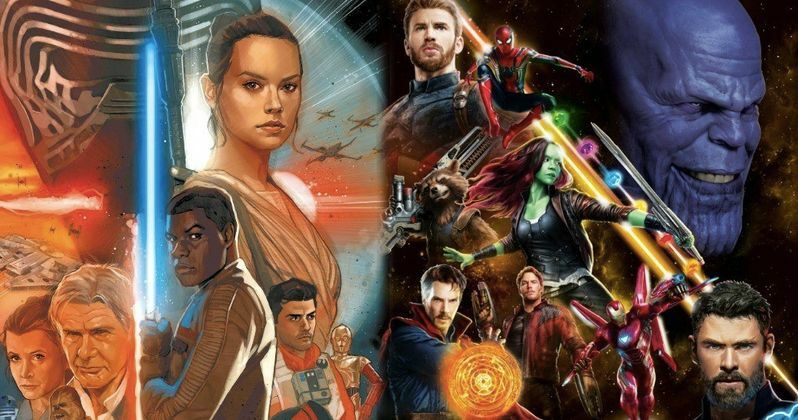 The non-Marvel Disney movies that pulled the feat off include The Force Awakens ($247.9 million) and The Last Jedi ($220 million). The only non-Disney movie to pull this off was Jurassic World in 2015 when it pulled in an unexpectedly huge $208.8 million. Box office tracking has proved to be a bit unreliable in recent years when it comes to big movies such as Avengers: Infinity War. For whatever reason, the old tracking methods simply can't account for fan demand correctly. With that in mind, it's not hard to imagine that Infinity War could actually wind up making even more than the $235 million number. Could Avengers 3 be the movie to top Star Wars: The Force Awakens? If any movie can do it, this seems like this has the best chance to do so. It could wind up being very close. Currently, there are no predictions available for the international box office on opening weekend for Avengers: Infinity War, but expect many records to be broken. With the release date fast approaching, we should expect, for one, a full-length trailer to drop very soon. Pre-sale tickets should also go on sale any day now, so be sure to keep your eyes peeled for that. Demand is going to be insanely high and the early screenings are going to sell out very, very fast. Once the pre-sale numbers start coming in, we'll have an even better idea of just how much money Avengers: Infinity War may make on its opening weekend. This news comes to us courtesy of That Hashtag Show.